Early in the life of this blog, I did a mass roundup of royal engagement rings. For a long time it was one of my most popular posts, and prompted a lot of questions for more details and more rings. So, it's time for an update - this time, an in-depth one, in a mini series for our Fridays. Now, I will not be attempting to cover all royal engagement rings, and in some cases a bit of guessing and assumption is required. We start in Britain, where the most famous royal engagement rings reside. There's a rich history of colored stone rings to mark engagements or weddings in British royal history; Queen Victoria received an emerald serpent ring from Prince Albert, Queen Alexandra received a multi-stone ring from the future King Edward VII (of beryl, emerald, ruby, turquoise, jacynth, and a second emerald, spelling "Bertie", his nickname), Queen Mary was given a ruby ring by Prince Albert Victor (he passed away during their engagement and she ended up marrying his younger brother, the future George V). That tradition has continued, with diamond rings entering the mix mostly in the last generation or two. Lady Elizabeth Bowes-Lyon received a sapphire ring from the Duke of York (shown above left), a stone we'll see over and over again with Windsor brides, and one she said at the time was her favorite. It had diamond accents, and was paired with a Welsh gold wedding band. Later in life, in the 1950s, she chose to abandon her original engagement ring in favor of a large pearl surrounded by diamonds (above right). Why she made the switch, we don't know - but as we will see as we continue with this series, switching rings or simply not wearing one's engagement or wedding ring is not uncommon. The Queen's diamond and platinum ring seems somewhat rare among all the colored stone rings received by her family members during the era of her engagement, but it is an instant classic. 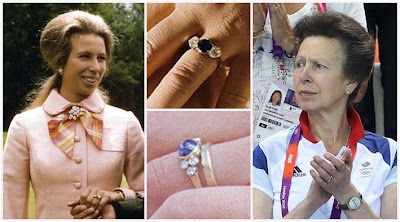 It was made for her using stones taken from a tiara belonging to Prince Philip's mother - click here to read more about this ring. She still wears it every day, alongside her Welsh gold wedding band. 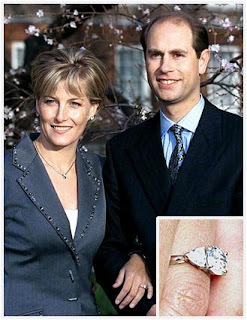 Lady Diana Spencer chose a large oval sapphire ring (sometimes reported to be 18 carats, which is an exaggeration) surrounded by 14 round diamonds and set in white gold as her engagement ring from the Prince of Wales. 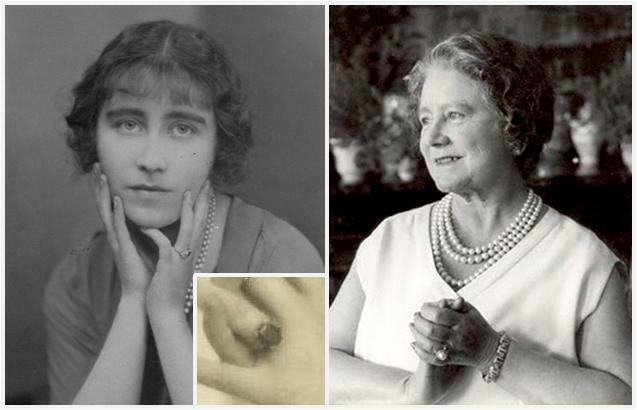 The ring was made by Garrard, and unusually for a royal engagement ring it was not bespoke; the actual cost was available, which caused a bit of a fuss. There's nothing especially unique about the design, but it has become perhaps the most famous engagement ring (and most copied) out there. After Diana's death, it was reported that Prince Harry had selected the ring to keep, but of course it was Prince William that used it to propose to Catherine Middleton. She wears it with her Welsh gold wedding band, just as Diana did. 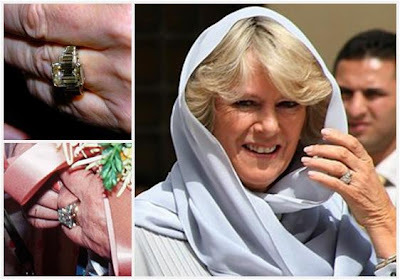 For his second marriage, the Prince of Wales presented Camilla Parker Bowles with a ring that belonged to his beloved grandmother, the Queen Mother (shown in the lower close up picture above). It's a large emerald cut diamond ring with baguettes to either side which is often said to have been a gift to mark the birth of her first child, Princess Elizabeth - the current Queen, of course. Though it is an impressive ring and surely extremely valuable, its cut does not reflect light well and it doesn't always look its best in a photo. For her first marriage to Mark Phillips, Princess Anne was given a classic ring of a sapphire between two diamonds (top close up). She also has a sapphire ring from her second husband, Tim Laurence, this time with a cabochon stone and three small diamonds on each side (lower close up). The first one is classic, and there are many similar rings out there; but the second one, a little more unusual, seems a better fit for this particular princess to me. Princess Anne's son Peter Phillips, the first of the Queen's grandchildren to marry, presented his fiance Autumn Kelly with a ring containing a larger center oval diamond with more diamonds to either side. Some reports placed the cost of the ring at £80,000 (though these things are always to be taken with a grain of salt). 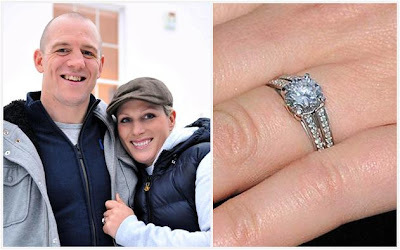 Princess Anne's daughter Zara Phillips received a custom-designed diamond and platinum ring from Mike Tindall to mark their engagement. The sparkly number features a divided diamond-set band with a solitaire diamond centerpiece. 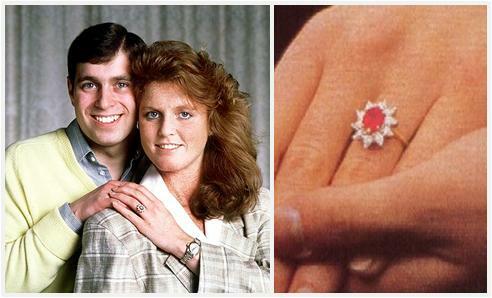 Like Diana, Sarah Ferguson also received an engagement ring from Garrard. She's often said to have requested a ruby ring over the emerald ring supposedly intended for her, and a ruby she got. It's an oval Burmese ruby surrounded by 10 diamonds set in white and yellow gold. 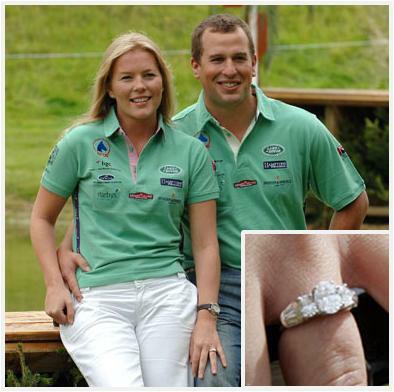 Like other Windsors, she also received a Welsh gold wedding band. The ring given to Sophie Rhys-Jones by Prince Edward was reported at the time of the engagement to be the most expensive royal engagement ring ever purchased at an estimated £105,000. Of course, we don't know if that still holds true - well, we don't know if it was ever 100% factual, really. If you include the estimated value at market of some of the famous rings we see here, it certainly wouldn't be true today. Nevertheless, it is a sparkler indeed: a 2 carat oval diamond with a heart-shaped diamond on either side set in white gold from Asprey and Garrard. Classic, with a romantic twist. Sophie also wears a Welsh gold wedding band, but she doesn't always wear her wedding set these days. Coming up next Friday: Part 2 of British engagement rings.